WFJ-30/60/80/110 Series Micronizer consists of main motor,auxiliary motor and electrical control cabinet.It has the features of compact design ,simple structure,winnowing, and non-sieve or mesh.The negative pressure brings heat and particles out,so it is especially well applied in the industry of chemical,food stuff,pharmaceutics,cosmetics,fuel,resin and etc.Its performance is up to the international advanced level. The material is sent to grinding chamber through hopper and screw conveyer, and then pulverized by high speed rotary blades.Processed fine material are winnowed and collected by the negative pressure of an air intake of a blower,dust collector is included.The advantage of it are very little dust,high utilization of the raw material and cost reduction. Nowadays, YIBU company have customers both in China and abroad.Foreign customers such as Russian,East Europe,Middle East,South America,North America,East Asia,Southeast Asia, Africa,etc. ◆ The material enters the grinding chamber via the screw feeder and then sheared and broken by the fast-rotating knives .The power passes the guide ring and enters the classification chamber. As the classification wheel is in revolution, both the air force and centrifugal force act on the powder. 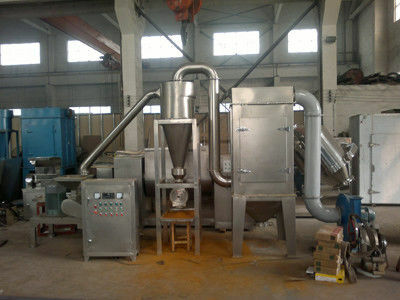 ◆ As the particles whose diameters are greater than the critical diameter (diameter of the classification particles) have a great mass, they are thrown back into the grinding chamber to be ground again, while the particles whose diameters are smaller than the critical diameter enter the cyclone separator and bag filter via the material exit pipe be means of negative pressure wind conveying .The discharge material meets the requirement for the product. 1 In the machine chamber, there is the leaf structure. When operation, the air in the grinding chamber is blown out by the rotary leaves taking out the heat. Therefore, there is not much heat in the chamber to ensure the characteristic of the material. 2 When operation, the strong air flow can expel the material out. So it can pulverize the heat sensitive and sticky material with good effect. 3. For the good performance on the heat, it can be the substitute of universal crusher. 4. 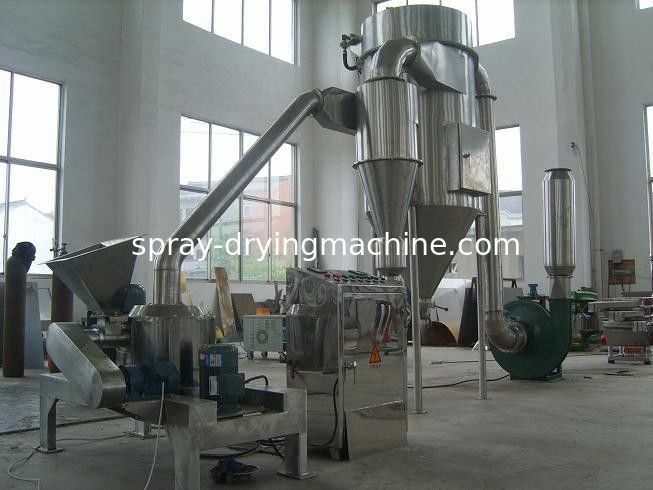 Expect the pull force of the fan, the air flow in the grinding chamber blows the fine powder out (the fineness of the powder is adjustable through the sieves). Thus, it can increase the capacity of the machine.